People Do Go to Jail for Animal Cruelty…YAY! People do go tojail for animal cruelty in Los Angeles County. The NoHo Arts District dot Com team and our East Valley neighborhoods are animal lovers and we do our part to help raise awareness of homeless animals and pet adoptions. We even have our own pets blog by Sarah Serrano. 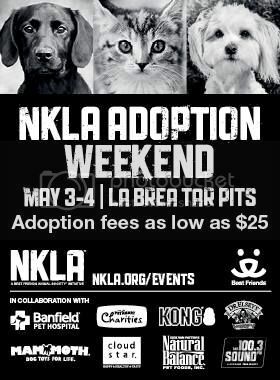 When our local friends told us about the No-Kill Los Angeles (NKLA) Adoption Weekend, we knew we had to spread the word. Here’s the official Facebook invite you can use to pass the word to your family, friends, coworkers, chiropractor, manicurist, mechanic, neighbor, boss, employee, etc. On another note, if you can’t make it out to this adoption event, you can always go to the East Valley Animal Shelter to find your next furry love. Free Admission! You can select your new love from more than 1,000 dogs, cats, puppies and kittens from more than 50 Los Angeles rescues and shelters! ! Shelter adoption fees are as low as $25 and include spay/neuter, updated vaccinations, microchip and an adoption starter kit. You’ll be surrounded by knowledgeable animal groups, dog and cat lovers, and there will be food trucks, vendors and fun! Most importantly, you can help turn L.A. into NKLA (No-Kill Los Angeles). Did you know that at the first NKLA Adoption Weekend last May more than 400 animals found homes? We here at nohoartsdistrict.com hope they beat that number. If you can't responsibly adopt a fur baby, then you can come out to the event and support, and have fun. LittleFriendsPhoto Fan? UNDERWATER DOGS photographer, Seth Casteel, will sign his New York Times Best Selling book on SUNDAY MAY 4 from 10am-3pm! Books and calendars will be available for sale with proceeds to benefit Best Friends Animal Society.